The DS-C9509 MDS 9509 Director is a multi-layer Cisco switch providing up to 7 blades and 224 FC ports in a single chassis or 672 in a rack. Cisco 9509s are top tier director-class switches offering leading availability, scalability, security, and management. Vibrant buys and sells new and used Cisco MDS 9509 systems and blades. 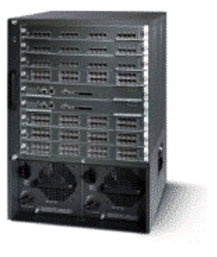 The Cisco MDS 9500 Series allows for the deployment of high-end SANs with a low total cost of ownership. Dimensions 24.5" x 17.25" x 18.4", 55lb or 170lb fully configured. Layering a rich set of intelligent features onto an open-protocol high performing fabric, the Cisco MDS 9509 switches address the stringent requirements of enterprise storage environments. Advantages offered by the 9500 series switches include high availability, scalability, security, easy to manage and straight forward integration of new technology. For pricing on new or used Cisco MDS 9509 switches, upgrades or parts, please contact Vibrant sales at sales@vibrant.com or call 888-443-8606 or 952-653-1700.